A robust, brown and scaly Agaricus. They were growing in some wood chips under two big Norway Pines down the block. I was up very early one morning, so I snuck into their yard to pick a few (I had been coveting my neighbor's mushrooms). A slow, yellowish to reddish bruising in the flesh. A definite almond-like smell. Thick, cottony veil over the gills. Gills started out very light and pinkish, that slowly turned dark brown. 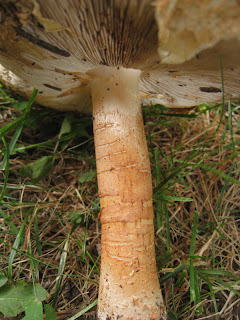 The stalk scaly for most of its length, becoming smooth at the very top. 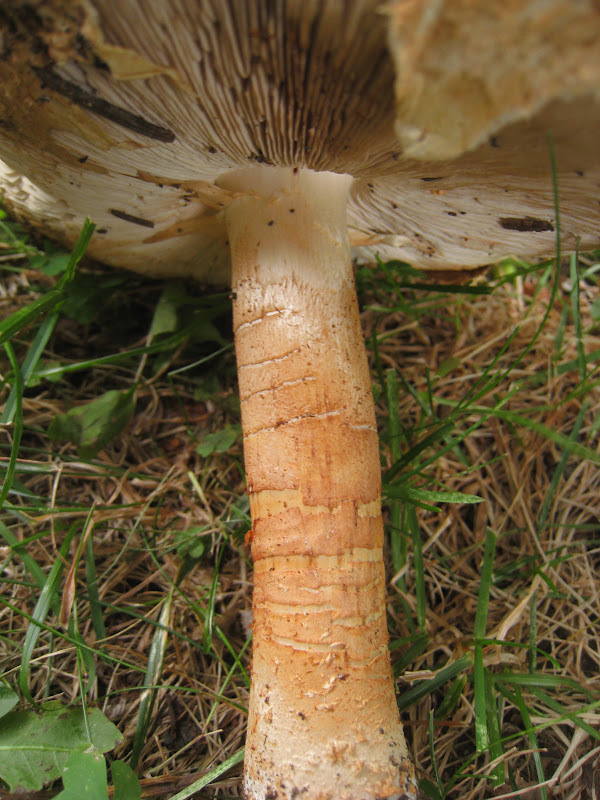 Typically, these mushrooms would form a skirt-like ring around the stalk, but in this case the veil stuck to the caps edges instead of forming a ring. Hmm . . .
A distinctive bolete with a off center stalk. I think it should be called the Flying Saucer Bolete. 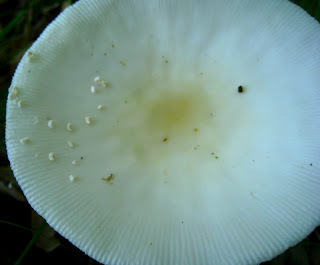 I'm fairly certain on the id of this mushroom, but it is a fairly nondescript mushroom; brownish cap, white gills, whitish stem, and white spore print. One feature that doesn't match is that this mushroom grows from rotten wood. 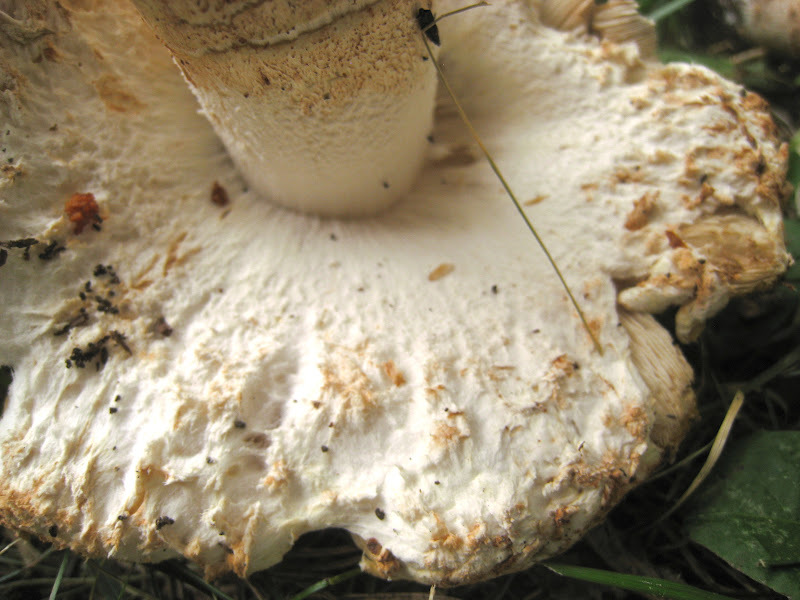 The mushroom pictured appears to be growing from the ground, or from the bass of a (live) oak tree. But the rotten wood could be buried, and in this case it could be a rotted root of this tree (perhaps caused by a species of Armillaria, or honey mushroom, common where I found this mushroom). 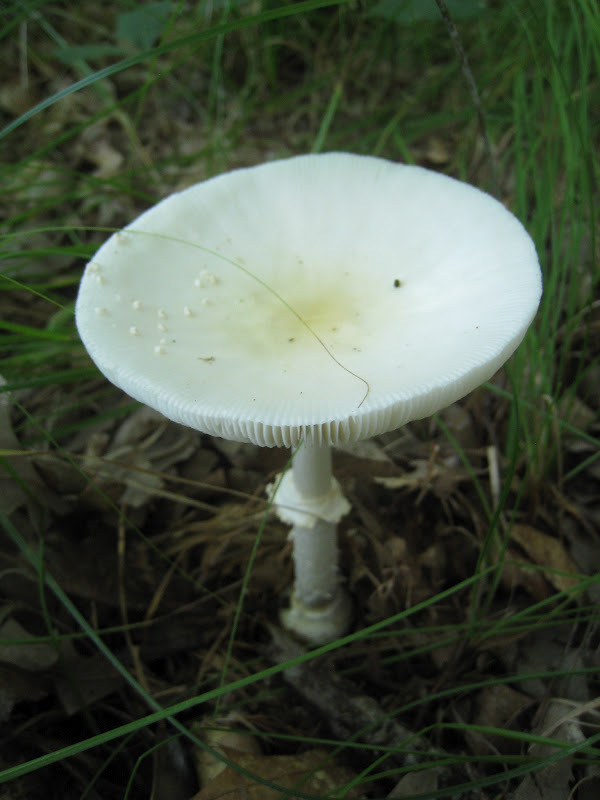 I think the common name, Platterful Mushroom, is derived from the its scientific name, Tricholomopsis platyphylla. It is edible, but like I said, pretty nondescript, making id a little iffy. Fuzzy Foot - Xeromphalina sp. A smallish, slender Amanita that grows under hardwoods. White cap with a yellowish or brownish center, white warts, and faint lines along the margin. White stem with a skirt-like ring (or small funnel-like), smooth above, a bit scaly below. The "cup" is bulb shaped with a collar. My semi-obligatory "Recent Mushroom" post LBM.